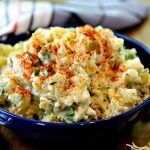 The flavor of this classic, creamy potato salad is enhanced by using fresh herbs—tarragon and parsley—in the dressing. You'll make Grandma proud with this recipe! Wash potatoes and place in a large pot. Cover with water and bring to a boil over medium high heat. Cook for 30 to 40 minutes or until tender; drain and cool 15 minutes before peeling and cutting into i-inch cubes. Place potatoes in a large bowl with the diced celery, green onions, and chopped eggs. Stir gently. In a separate bowl, whisk together the mayo and sour cream with the chopped herbs, garlic, and mustard. Season with salt and pepper. Pour dressing over potato mixture and stir gently. Serve immediately, or cover and chill up to 12 hours.